I created this recipe in hopes of it being a big hit at our local festival. I was co-chairing a food booth for my son's school and I thought this would fly off of the proverbial shelves. A combination of bad location and signage led to less than enthusiastic results. However, on the upside, I created something that tasted really good. Why bother making a pumpkin cream cheese? Well, if you like the flavor of pumpkin pie, you'll probably like this. When you make your own, you control the ingredients, like sugar and spices. By adding pumpkin, you also boost the nutrition, especially the fiber. 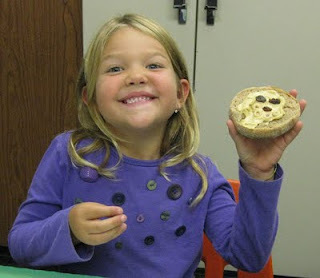 We served it on English muffins and then gave the children raisins and Cheerios with which to make faces. It's also good as a dip for pretzels (think salty with sweet; yum) or apples and would be great on a pumpkin muffin. You could even make a sandwich out of it with sliced apples...not a bad idea! It will keep in the fridge for a week; I wouldn't try freezing it. Remember, keep key ingredients on hand (I always have at least 1 can of pumpkin in my cabinet) and preparing food will seem much easier. Enjoy. Using a hand mixer, beat cream cheese until light and fluffy. Mix in other ingredients. Refrigerate for 30 minutes before serving. Ok, this is the week to carve your pumpkins. Instead of throwing away the inside, consider two options: compost or toasting the seeds. Did you know pumpkin seeds are very nutritious? I'm looking forward to burying my pumpkin remains in hopes of creating a pumpkin for next year. We did this a few years ago and it actually worked! Work quickly; if you don't clean the seeds right away, the pulp will dry and be difficult to remove. If necessary, place in a ziploc bag to keep moist. Wash the seeds in a strainer to try to get as much as the pulp off as possible. Use a kitchen towel to dry the seeds and make them less wet. Toss with olive oil and salt. You can also use sugar and salt for a "kettle corn" flavor, chili powder with cumin, or garlic salt. Use a large enough baking sheet and make sure there is a single layer. Otherwise, use 2 sheets. Bake in a low oven, no higher than 325ºF or you risk the seeds burning. If the seeds have gotten soft during storage, pop into the toaster oven for a few minutes. Although it's nutritious, this might be hard for children under 3 or 4 years old to eat. 1. Wash pumpkin seeds, trying to remove as much of the pulp as possible. 2. Dry seeds with a kitchen towel or paper towels. 3. Toss with about 2 tsp olive oil and 1/2 tsp kosher salt. 4. Pre-heat oven to 300ºF. 5. Place seeds on a baking sheet (I like the Chicago brand) and place in oven. Stir every 10 minutes and cook about 25-28 minutes or until golden and toasted, being careful not to burn. 6. Once cool, place in an airtight container and leave at room temperature. What type of experience do you have in the supermarket? Are you frazzled and exhausted or relaxed and calm? are hungry ("Yes, I think we are out of chips. And cookies. And cheese and crackers..."). Here are some thoughts to make that trip something satisfying and not stressful. 1. Start with a list, even if it's written on the back of something you find in your bag. If you go in thinking about lunches and snacks you need to prepare for the week, upcoming parties and pot lucks, and what you need to stock up on, it might be easier to stick to what you really need. 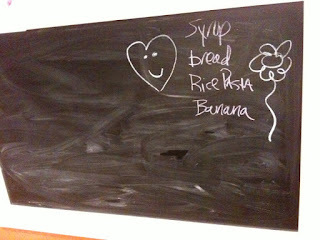 I have a chalkboard in the kitchen. When I run out of mayo or a certain cereal, it goes on the board. I find this helps to keep me organized so I'm not making multiple trips to the store (which saves me time in the long run). 2. I leave the kids behind, most of the time. If I give myself enough time, I like to walk around the store to try to get inspired or to look for deals on something I can stock up on like pasta, cereal or canned food. It's worth it to me to get a babysitter for this or use the time while the children are in school. Or, I do it on the weekend very early before everyone else is out and about, or even at night. 3. If I'm bringing the kids, I definitely need to add "strategy" to the shopping list. When children join you at the grocery store, you can't blame them for wanting certain cereals or cookies. Marketing to children is an entire business. Look at where these items are in the store; at the end of the aisles and on their level. Why isn't Dora on a bag of spinach?? Are the items with the characters more nutritious or some times less? Is that what you want to serve them? It's disappointing that often times the most fun looking package contains the worst ingredients. Be aware of this. You are still the parent who has control of the money. If you get a chance, watch the movie Consuming Kids: The Commercialization of Childhood and see what you think after that. It might change your mind on what you buy. 4. Food is expensive. There's no denying that. Some people believe there are long term health benefits associated with eating healthier, both for ourselves and especially for our children. Don't assume the local farmer's market is always expensive. If you are buying food that is in season and abundant, you might get a better deal as well as higher quality. Look for sales but always read the labels to see what is in it. If the price of yogurt seems like a good deal, just make sure there's no high fructose corn syrup in it. Maybe that's why it's so cheap. Same goes for bread and cereals. 5. The best way to stick to a budget is to stick to simple foods that you prepare yourself. When you buy chicken nuggets, macaroni and cheese or brownies in a box, you're spending a lot of money for processing and packaging. Try some recipes from my blog for bbq chicken tenders, quick and easy stove top macaroni and cheese (yes, you can make a white sauce!) or "better than a box" brownies, even gluten free brownies. Also, be careful of what you pick based on the sign. Some items look like they are on sale but the price is just highlighted. Take that extra minute to see if it's a real savings or not. 6. Last but not least, remember the motto: don't shop while you are hungry. It's something I tell people but the reality is, I can't always plan that. If I have a few extra minutes, I'll get a salad from the salad bar first (or even a fruit smoothie) and eat it before I start shopping. That gives me an extra 5 minutes to look at my list and try to stick to it. You may not put grocery shopping in the category of "fun" but by using these tips, hopefully it will seem much less daunting. 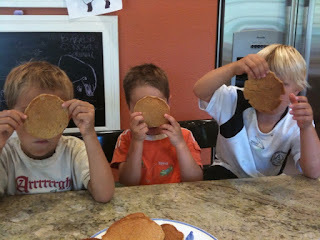 One year, I made a layered whole grain pancake mix to give as a Holiday gift. It was a big hit in our house and with others so I started making it on a regular basis. I adapted the recipe, originally from Parents magazine, to create the one below. I also doubled it since it seems to be easier to do all of the measuring at once. When I made the pancakes, I also doubled the recipe of the pancake batter. We had plenty for breakfast and I froze the rest. 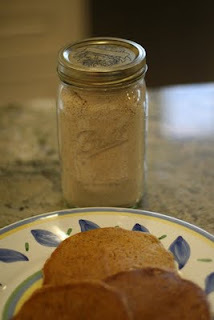 For those of you who buy a whole grain pancake mix from the store, don't be intimidated; it's very easy to do it yourself. 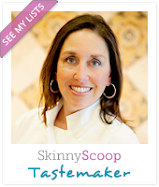 It's usually less expensive and you have more control over the ingredients. This one is packed full of nutrition. I served it to some of the neighborhood kids as a snack; they ate it just plain, without the syrup. Why not boost your nutrition in the morning by trying this recipe? It's worth every bite! It’s easiest to make this in a big batch and place in an airtight container. You can make a smaller batch by making 1/2 of it. Mix the following dry ingredients together in a large bowl using a whisk to incorporate the baking powder and baking soda into the flour. Place into an air-tight container. 1. Stir in 1 1/4 cup of dry pancake mix just until combined. Heat non-stick skillet over medium heat. 2. Pour 1/4 cup batter per pancake into pan and cook 1 1/2 to 2 minutes per side or until pancake is golden.